KSQD volunteers Joe Jordan, Rachel Goodman, Mary Flodin and Maia Rodriguez at the World’s Shortest 4th of July Parade in Aptos, Calif. Founders of a new radio station in Santa Cruz, Calif., hope to avoid the challenges that drove another local noncommercial station into bankruptcy by looking to volunteer hosts for a distinctly community-based sound. The founders of KSQD are negotiating a tower lease agreement with the University of Santa Cruz that has delayed their launch date. When the station does sign on, it will celebrate the eclectic culture in and around Santa Cruz with a diverse mix of locally hosted shows. 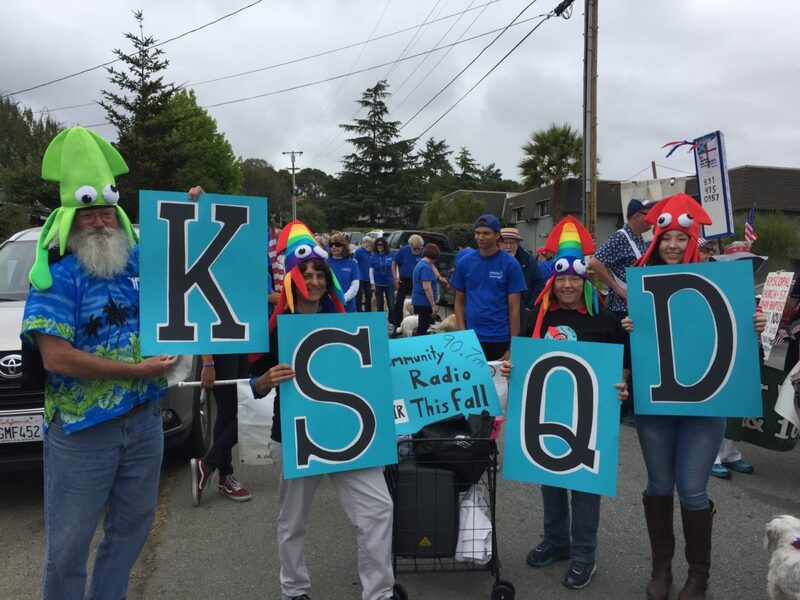 Pronounced “k-squid,” the station’s call letters refer to its official mascot and reflect Santa Cruz’s history as a hub for calamari fisheries and marine biology. KSQD’s founders previously volunteered for Santa Cruz’s KUSP, which went off the air in July 2016 after accumulating a debt of $850,000. Since then, quality local programming has been lacking, said KSQD co-founder Rachel Goodman. NPR affiliate KAZU in Monterey reaches Santa Cruz but largely features syndicated and national programming. The emphasis on local voices also aims to keep costs low and offer an alternative to KAZU’s programming. KUSP began cutting back on local shows in 2008 after discussions of a merger with KAZU ended without a deal. The two stations shared coverage areas and listeners, and both carried NPR programming. KUSP then added more national news programming and cut back on local shows to compete with KAZU’s all-news format, making the stations’ schedules nearly identical. Soon, KUSP could not afford dues to programming suppliers like NPR and American Public Media. It owed over $435,000 in deferred payments to program providers by the time it went bankrupt. After KUSP filed for bankruptcy, Goodman and several other past volunteers started raising money from supporters and local businesses to buy the station’s license out of bankruptcy court. But they were far outbid by Educational Media Foundation and had to return $95,000 in donations. Under the auspices of a new nonprofit, Natural Bridges Media, the former volunteers began looking for another frequency. They raised enough by December 2017 to sign a purchase agreement with EMF for another local frequency, 90.7 FM, which broadcasts Christian rock. The signal will overlap with KAZU, though the shared audience is smaller than that reached by KUSP. The frequency purchase was the first hurdle in what has been an ongoing “chicken-and-egg” process, according to Goodman. The $265,000 license and antenna agreement hinges on the station finalizing a tower lease with the University of Santa Cruz, a process that has been in negotiations for nearly nine months. Terms of the lease, including yearly rate increases, are still being worked out, pushing KSQD’s projected launch date from Sept. 1 to November or later. Once the deal is finalized, Natural Bridges will be able to close the agreement with EMF. “We are dealing with a large bureaucracy and lots of layers of legal protection from them,” said Goodman. Meanwhile, KSQD’s board of directors is putting finishing touches on other aspects of the station. It secured a low-rent lease for studio space with the county office of education and in exchange will start a radio training program for local high-school students. Programming Director Howard Feldstein has sifted through 136 proposals submitted by community members to create a schedule that aims to be as diverse as Santa Cruz. The station will air 78 local shows, including a show about mental health produced by a local psychiatrist, a show in Spanish and English about growing food, and a program about the struggles members of Generation Z face after leaving college. KSQD will also air several syndicated shows not carried in the market, including the Thom Hartmann Program and Democracy Now! The station has broadcast for nearly 45 years on air, and online for more than 20.